So this was the first line in an artical in the Albuquerque Journal's Westside section today, talking about the village I grew up in, Corrales. "Corrales is much more than a peaceful little community along the bosque with strictly enforced speed limits." The part I laugh about is the "strictly enforced speed limits", beacuse they really are. 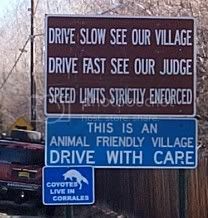 I mean we even have hummoiours signs when you enter the village telling you to obey the speed limits. In other news I leave in less then 24 hours for Wichita, KS. So only 4 more hours of work and then off to the airport for me.